"The creamy broccoli-cheese soup with pasta shells makes a quick and warming lunch or light supper." Pour 2 cups of chicken broth and half of the drained broccoli into a food processor and puree. Melt 1 tablespoon butter in a large pot; add onions and saute over medium heat until onions begin to soften, about 6 minutes. Add remaining 2 cups chicken broth. Bring to a simmer. Pour chicken broth/broccoli mixture into the pot. Simmer over medium-high heat 3 to 4 minutes, stirring occasionally. Place cheese packet from Horizon(R) Pasta Shells & White Cheddar Cheese, flour, melted butter, and half and half in a bowl. Stir until blended. Slowly add mixture to large pot; whisk over medium-high heat 2 minutes. Add Horizon(R) Pasta Shells & White Cheddar Cheese and remaining broccoli. Add a pinch or two of sea salt. Simmer until macaroni is done, 10 to 12 minutes. Remove from heat. Serve and top with shredded Cheddar cheese. 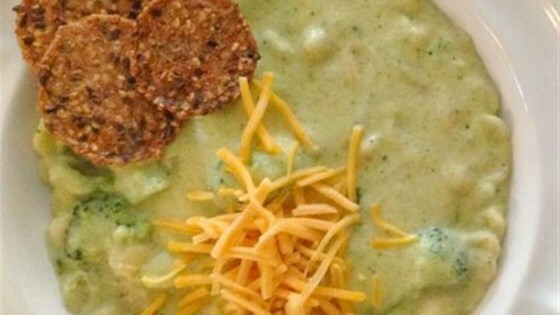 See how to make homemade broccoli cheese soup.